After voters passed the Move Seattle transportation levy in 2015, Seattle spent less than half the money planned for levy projects last year. But the city says it’s still on track to complete projects on time. Let’s say you’re remodeling your kitchen. It’s a big remodel — three months, $30,000 total, $10,000 to be spent each month. After the first month you take stock. The total cost hasn’t changed, but you’ve spent only $5,000 — and you’ll ramp up the spending in the next two months. But most (not all) of the projects you wanted to get done in month one — the blueprints, the floor tiles, the sink — are done. You’ve spent only half the money you planned on, but it looks like you’re on pace. What’s going on? That’s the situation the Seattle Department of Transportation (SDOT) is in, one year into the city’s $930 million Move Seattle levy, passed by voters in 2015 to improve streets, sidewalks, buses, bike lanes and freight travel in the city. Seattle spent only 60 percent of the levy funds it planned on spending in 2016. But the city’s transportation projects are not funded solely by the levy. Include other city, state and federal funds, and the city has spent less than half of what it planned on levy projects in 2016. Seattle budgeted $249 million in total dollars — city, state and federal — for 2016 projects that were included in the levy proposal. It spent only $122 million. But look at the list of projects. From a 2015 draft of “high priority” street repaving projects that were to be funded in 2016 by Move Seattle, five of six — 23rd Avenue, Renton Avenue South, Meridian Avenue North, South Spokane Street and Greenwood Avenue North — are done or virtually done. From that list, only repaving Third Avenue downtown has yet to begin. It’s likely to start next month. Other projects have been delayed as the agency worked with the City Council and community groups on the details. 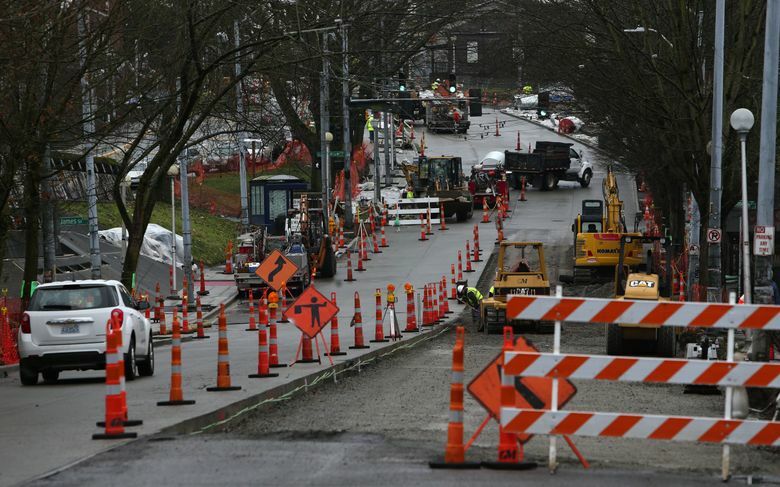 Long-planned improvements to Fauntleroy Way Southwest in West Seattle, which had been budgeted for $7 million in 2016, were pushed back due to a City Council request to study burying utility lines underground. About $6 million in spending, for rehabbing bridges and retrofitting them for earthquakes, was pushed back. SDOT says its progress on those projects has been “a little slow,” but plans to get back on track. The levy’s passage didn’t obligate funds to any specific projects, just to three broad categories of transportation improvements: safe routes, maintenance and repair, and congestion relief. 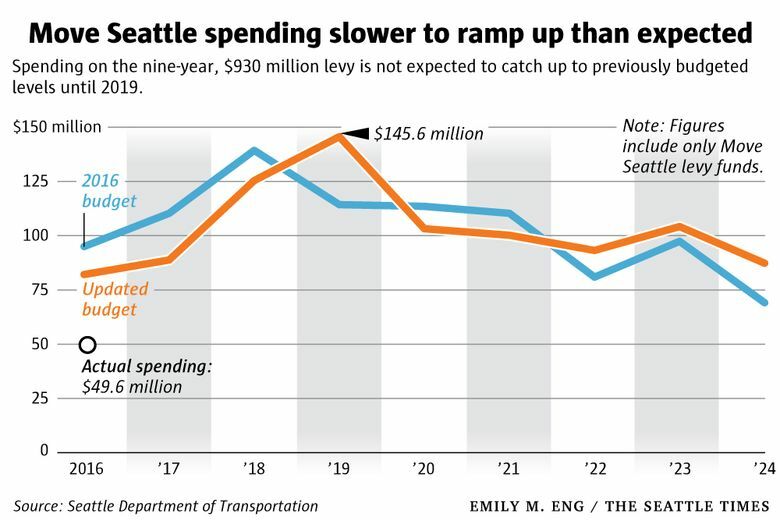 SDOT officials point to two reasons why spending lagged behind projections. It’s the first year of a nine-year levy, they say, so projects tend to be in design mode rather than construction mode. Construction costs more than design, so spending will ramp up soon enough. And, they said, the 2016 numbers account only for money actually spent — paid to contractors — not money that’s been obligated as part of an ongoing project. When SDOT reran the numbers to include money that’s been obligated, they said the spending comes very close to the budgeted number. Doug MacDonald, a former Washington state secretary of transportation who has followed Move Seattle’s progress closely, said the low spending isn’t cause for alarm, but SDOT’s rationale doesn’t make much sense. “When you’re managing a program of $930 million over nine years, with God knows how many projects, the shifting back and forth to get the money to where you can best use it is the art of managing a project successfully,” MacDonald said. But SDOT’s reasoning for the slow spending, MacDonald said, could have been factored in before spending estimates were made. And spending is not going to ramp up, or even catch up, immediately. SDOT also has adjusted its Move Seattle spending figures going forward. It now projects to spend about 21 percent less than anticipated this year and 14 percent less in 2018, before increasing projected spending by 30 percent in 2019. Of the 35 annual metrics that SDOT set to measure Move Seattle’s progress — things like painting crosswalks, adding sidewalks and improving traffic signals — the agency said it hit all but two of its goals in 2016. It missed on creating more “calmer” residential streets with lower car volumes and speeds (neighborhood greenways), and on protected bike lanes — where it built a little less than half of its 7.5-mile 2016 goal. SDOT says it expects to build nearly 5 miles of protected bike lanes this year. And after leaving a long-planned protected bike lane on Union Street out of updates to its plans to add a Rapid Ride bus line on Madison Street, SDOT quickly reversed course and said it would be reinstated. Betty Spieth-Croll, the co-chair of the levy’s oversight committee, said she doesn’t think the levy has gotten a slow start, and is not concerned about lower spending numbers.